Students and higher education staff from across the UK have teamed up to imagine a screenless student experience as part of Jisc’s edtech challenge. The winning idea from a University of Glasgow team uses the “memory palace” technique to create an immersive environment that aids learning. The vision is for an interactive, collaborative space for independent learning without constraints of time or location. The judges chose this idea as it best encapsulates the benefits of learning in an immersive environment, is informed by students ideas and addresses accessibility and inclusion requirements. 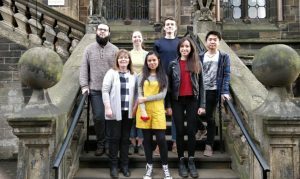 Receiving the £1,000 top prize are Dr Mary McVey, a lecturer at the University of Glasgow’s School of Life Sciences, and a team of eight students. Mark Shand, from the University of West of England, replaces the VLE interface with a patient simulation dummy, brought to life using technologies such as Bluetooth, sensors and augmented reality to challenge assumptions and requirements about a modern learning environment. The dummy is aimed at nursing students. Leanne Fitton’s idea, Boxi, pulls together emerging technologies to create a learning companion. The student, from Manchester Metropolitan University, wants to change the way in which we think of VLEs using some retro learning technologies such as paper or a whiteboard, as well as newer innovations including chatbots. Two University of Hull staff members‘ vision of how, through better use of data, learning can be “dripped” seamlessly into students’ schedules. Thomas Tomlinson and Mike Ewen’s idea can assess health and wellbeing considerations through wearables and seamlessly connects to devices in the university, home and community, allowing students to access learning whenever and wherever it suits them – when they are at their most receptive. “The winner and most of the ideas submitted have real-world application potential and the ideas that attracted me the most are deliverable and had direct student benefits. The edtech challenge was open to all college and university students and staff with good ideas to share.